There are lots of colourful parrots in the rainforest. Although some parrots do live in temperate climates and even inhabit dry areas, most of the world's 370 species of parrots live in tropical climate and in rainforests. Parrots belong to the order Psittaciformes, which is further divided to true parrots (Psittacidae), cockatoos (Cacatuidae) and New Zealand parrots (Strigopidae). Most of the world's parrot species are found in South America and Oceania (including Australia) - a fact that suggests they originate from Gondwana continent. Others include Pacific Islands, south and south-east Asia, Africa, Central America and some Caribbean Islands. Parrots typically have strong curved bill, reflecting their diet - seeds, nuts, buds, fruit and other plant material. Some species also eat insects, and some, particularly lorikeets specialise in nectar. Almost all species lay white eggs and nest in tree hollows. They are also some of the most intelligent and social birds, and they can imitate peoples' voices - something that makes them popular pets and common targets for pet trade. Other threats they face are habitat loss, hunting, and competition from introduced species. * Loriinae - about 50 species of lorikeets and loris, mainly New Guinean, but also Pacific Islands', Indonesian and Australian parrots. 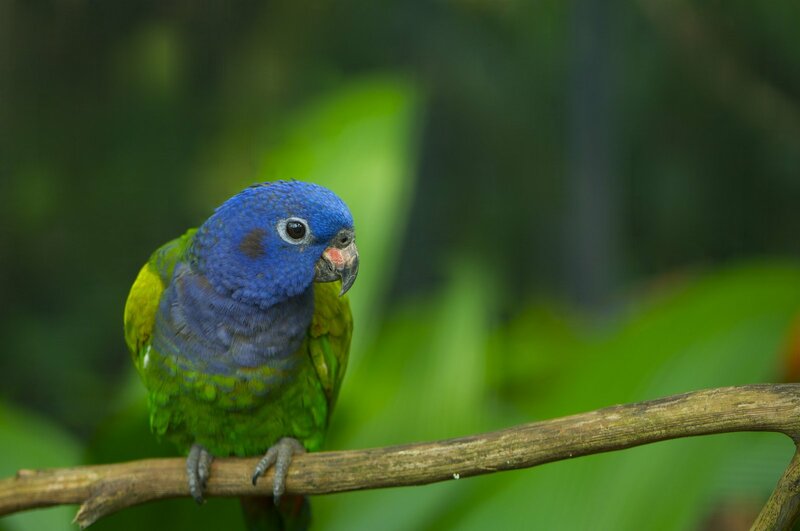 * Micropsittinae - six species of pygmy parrot, found in New Guinea, and also some neaby islands. * Psittacinae - several different subgroups of mainly African and South-east Asian parrots. * Platycercinae - several subgroups including rosellas, parakeets, budgerigars and broad-tailed parrots. Parrots in the Rainforest: Cockatoos and Cockatiels (Cacatuidae) are quite different from true parrots. They have lost the green colour and are mostly white, black or pink. Another distinctive feature is the mobile head-crest that true parrots lack. * White cockatoos - e. g. salmon-crested, sulphur-crested, major mitchells, galahs and corellas. * Palm cockatoos - some of the smartest cockatoos with huge crests and beaks, which are only found in Cape York, Australia. New Zealand Parrots (Strigopidae) include Kea, Kākā and the flightless Kākāpo. These are the rare parrots that don't inhabit tropical regions. Kea is a large greenish-brown parrot that lives in the Alpine regions on South Island. Kākā and Kākāpō live on both South and North Islands. The flightless Kākāpō is the heaviest parrot in the world.